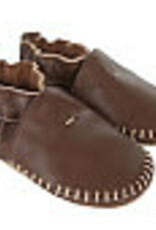 Premium Leather Moccasin Soft Sole in Classic Brown. Featuring a suede bottom & room to grow, they're flexible with movement & non-constricting for better balance. With an elastic ankle & pull tab, soft soles are easy-on STAY-on!